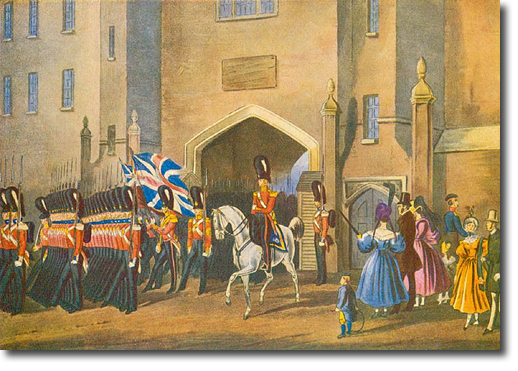 This print shows the Grenadier Guards dismounting guard at St James's Palace. Company Colours are carried by ensigns guarded by Colour Sergeants, and either the adjutant or commanding officer mounted on a grey horse. It was at St James's Palace that the future King Edward VII was born on 9th November 1841. The palace was guarded by a detachment of the Queen's Guard captained by a junior officer. Tradition had it that on the birth of an heir to the throne, the Captain of the Guard of that day was promoted to brevet major. But young Bertie was born at 10.48am in the middle of a changeover of the Guard (at 1045hrs). The two Captains of the Guards both claimed promotion and after much discussion the decision went to the old Guard, of the Grenadiers.